The performance presents a small part of the novel with a missing space that leads the child to read the whole story. Performers: Maisoun Abu Asaad, Shadi Muqresh. This performance was presented in cooperation with Teatro Institute of Performing Arts. ‘Momo’ was performed for more than 100 times. 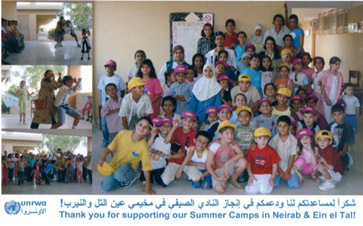 The performances started at the schools of UNRWA in Damascus, October 2004 until the beginnings of 2006. Momo was performed in the World Book and Copyright Day along with the release of the audio CD ‘Momo’ in the Arab Cultural Center in Damascus, April 2005. It was also performed in the Children’s Theatre Festival 2005, and in ‘Ein Al-Tal’ and ‘Nairab’ camps in Aleppo. Sponsored by Goethe Institute in Damascus.